Maintaining its long-standing tradition of supporting HIV/AIDS charities, Kiehl’s Since 1851, the venerable New York-based purveyor of fine quality skin and hair care, celebrates its continued partnership with amfAR, The Foundation for AIDS Research, via the fourth annual Kiehl’s LifeRide for amfAR. With the mission to heighten awareness, and raise funds for amfAR, the company embarked on a charity motorcycle ride, from July 31 – August 8, 2013, through the Pacific Northwest. Inspired by Kiehl's history with motorcycles, spirit of adventure, and philanthropic heritage, the ride was led by Chris Salgardo, President, Kiehl’s USA and Kevin Robert Frost, amfAR CEO, riding with fellow motorcycle enthusiasts joining the fight against HIV/AIDS, including actors John Corbett, Gilles Marini, Kurt Yaeger, Teddy Sears, and World Cup Rugby Champion Ben Cohen. To celebrate the LifeRide finale on August 8th, amfAR’s Global Fundraising Chairman, Sharon Stone, attended and accepted the $150,000 donation to amfAR at The Grove in Los Angeles. The event also featured performances by Kelis and music by Spinderella. In addition to the group of LifeRiders, Tricia Helfer and Katee Sackhoff rode motorcycles to partake in the festivities, and Brigitte Nielsen, Donal Logue and Mo McRae attended with family members. The complimentary festival was open to the public, featuring art installations, photo booths, airbrush tattoo stations and children’s activities. •	LIMITED EDITION PRODUCT TO BENEFIT amfAR: In celebration of LifeRide, Kiehl’s has introduced a Limited Edition Ultimate Strength Hand Salve, a new, jumbo size of the company’s classic formula and customer favorite. 100% of Kiehl’s net proceeds from the sale of this product, up to $25,000, will benefit amfAR. Available in a specially designed 7.8.oz size, it is adorned with a red cap. It is $28.50 at Kiehl’s retail stores and specialty store partners nationwide, and at Kiehls.com/LifeRide. 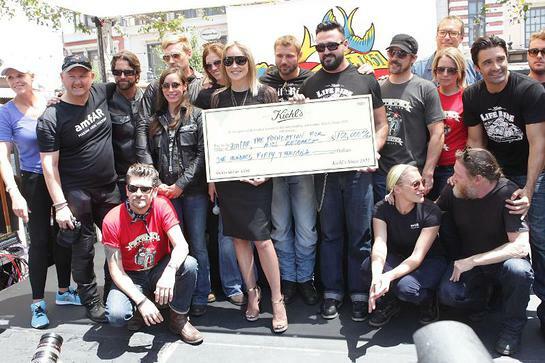 •	DONATE IN STORE AND ONLINE: Visit any Kiehl’s retail store or Kiehls.com/LifeRide to donate directly to the cause. Key partners for the ride include Harley-Davidson Authorized Rentals, the world’s largest provider of motorcycle rentals, and Delta Air Lines, which serves more than 160 million customers each year. Additional support is provided by Dreamworks Studios, Les Ateliers Ruby Helmets and Belstaff. HIV/AIDS awareness has long been at the forefront of Kiehl’s philanthropic efforts, and through partnerships with organizations like amfAR, as well as the Magic Johnson AIDS Foundation and YouthAIDS, Kiehl’s has proudly donated more than $2,500,000 for the cause. To find out more about LifeRide and get involved in the fight against HIV/AIDS, please visit www.Kiehls.com/LifeRide.